New Zealand is an island country in the Pacific Ocean, with a population of less than 5 million. The Maoris are the country’s indigenous inhabitants. New Zealand became a British colony in 1840, following which a large number of Britishers and other Europeans migrated and settled in the country. New Zealand gained independence in 1947. The majority of New Zealanders (74.4%) are of European descent while the Maoris constitute 14.9% of the population. The rest are migrants from dozens of countries from around the world. 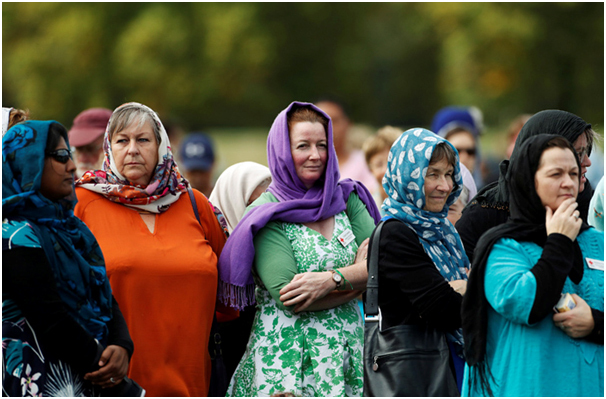 The population of Muslims in New Zealand is around 50,000, which accounts for about 1% of the island nation’s population. 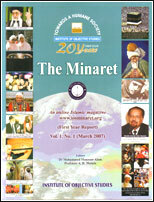 The majority of Muslims are from South Asia, Southeast Asia, the Middle East and Somalia. 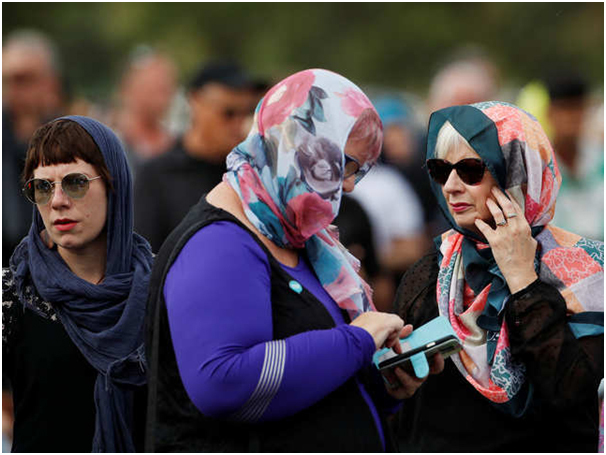 On March 15, when hundreds of Muslim men, women and children had gathered at Al Noor Mosque in Christchurch, Brenton Tarrant, a 28-year-old white Australian man, entered the mosque and started indiscriminately firing at the worshippers. He had magazines of ammunition strapped to his legs. At least 43 people, including elderly men, women and children, were killed in the massacre and dozens of others wounded. 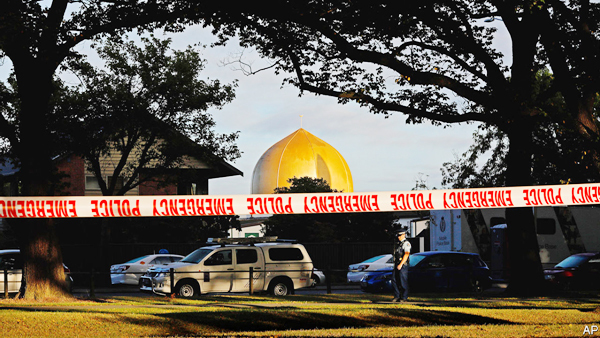 He then travelled to another nearby mosque in Linwood and opened fire at the worshippers, killing at least seven persons and wounding several others. Tarrant, a white supremacist, posted a 74-page manifesto – called “the Great Replacement”-- on social media, in which he described non-white, Muslim immigrants as invaders and admitted contacts with an anti-immigrant group called the Reborn Knights Templar. 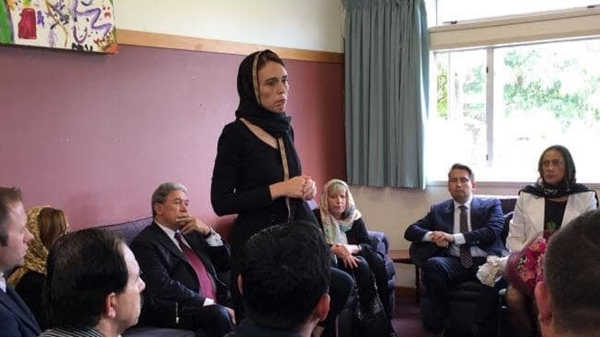 He sent a copy of the manifesto to the office of New Zealand’s prime minister Jacinda Ardern minutes before the massacre. With a camera strapped to his head, he livestreamed footage of the massacre on Facebook. Facebook said it removed 1.5 million versions of the video during the first 24 hours of the shootout. 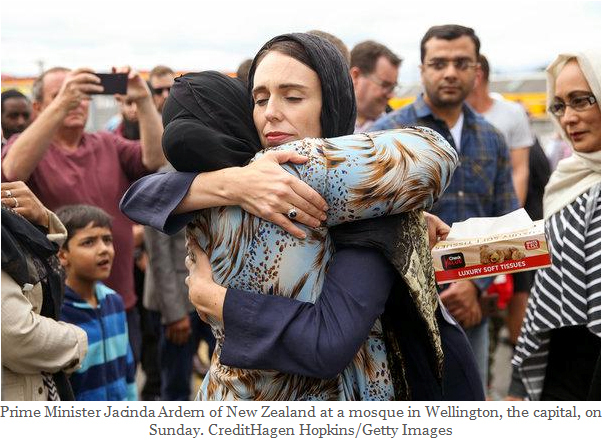 New Zealand’s Prime Minister Jacinda Ardern showed exemplary courage, sagacity and broad-mindedness in describing the incident as a well-planned terrorist attack. 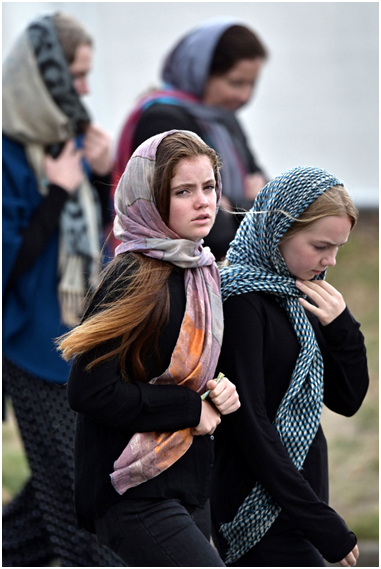 She rushed to the scene of the massacre, her head covered with a headscarf, and hugged the relatives of the victims. 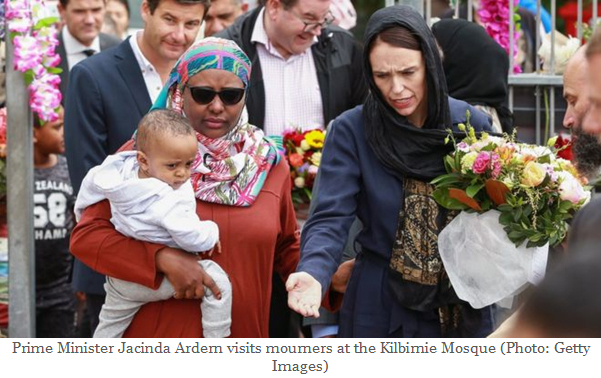 She told them, “We are one and Muslims are us.” A few hours after the attack, Ms Ardern announced a crackdown on the lax gun laws within 10 days. 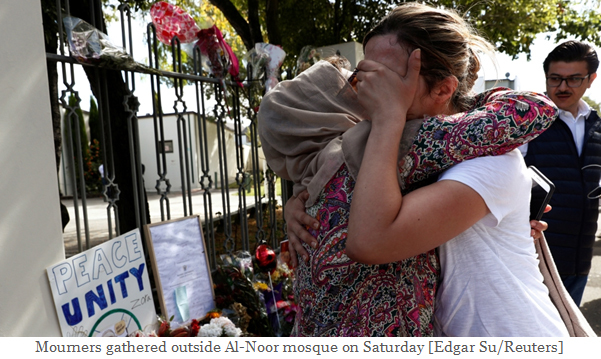 The bullet-ridden Al Noor Mosque was repaired, cleaned and painted a couple of days after the massacre and Friday prayers were held on March 22. 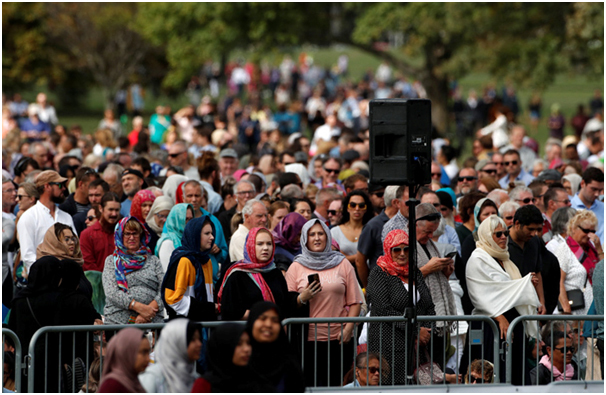 Thousands of Muslims from Christchurch as well as other parts of New Zealand attended the prayers. 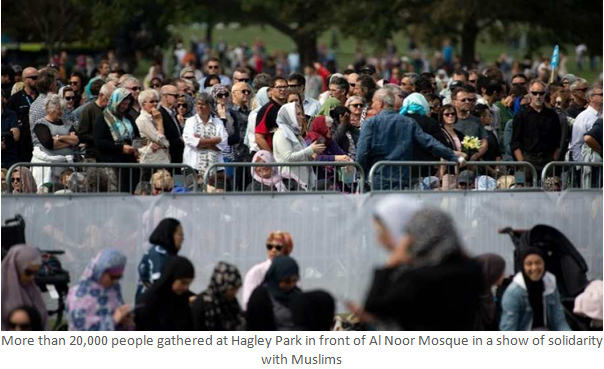 Thousands of New Zealanders gathered at Hagley Park in front of Al Noor Mosque on March 22 to pray for the victims of the massacre and to show solidarity with the Muslim community. 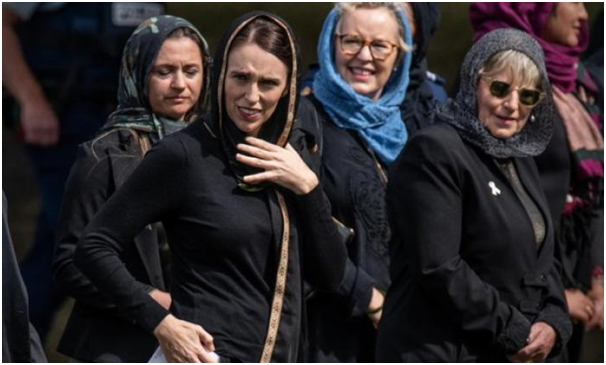 Ms Ardern, dressed in a headscarf, said in a short speech, “New Zealand mourns with you. We are one.” This was followed by two minutes of silent prayers. 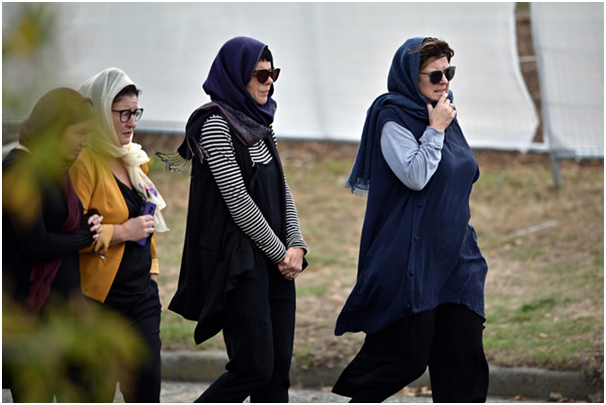 On March 22, hundreds of white and other women in Christchurch wore headscarves as a symbol of solidarity with Muslims and as a statement of peace and conciliation. 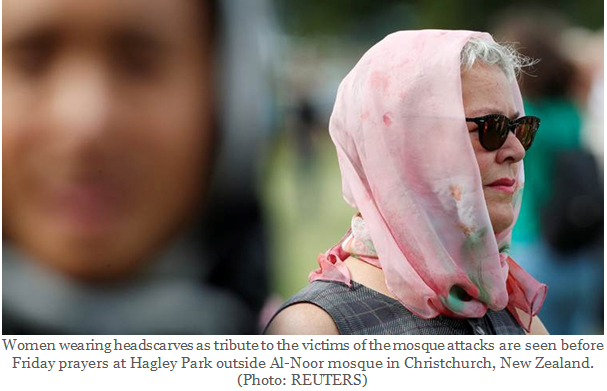 Many women posted their images in headscarf on Facebook, Twitter and other social media. New Zealand, whose population is less than 5 million, has an estimated 1.2- 1.5 million firearms. About 13,500 of them are MSSA-type weapons. New Zealand, apart from the United States, is the only country in the world which does not have firearm registration. Australia banned semiautomatic weapons and launched a buy-back programme for guns following the Port Arthur massacre in 1996, in which 35 people were killed. 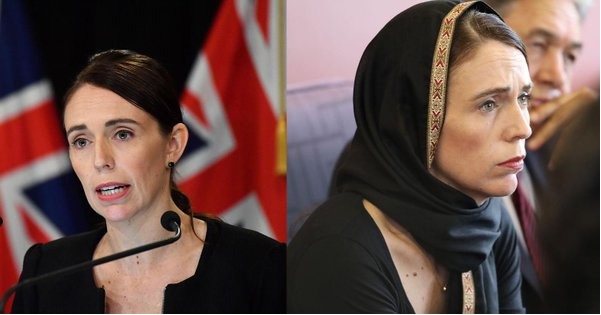 On March 21, Ms Ardern announced her government’s decision to ban military-style semiautomatic weapons under stringent gun laws. She said in a statement, “On 15 March our history changed for ever. Now, our laws will too. We are announcing action today on behalf of all New Zealanders to strengthen our gun laws and make our country a safe place.” She added that she expected the new gun laws to be in place by April 11 and that a buy-back scheme costing up to $138 million would be established for banned weapons. The proposed ban has been widely supported by New Zealanders and the opposition parties. 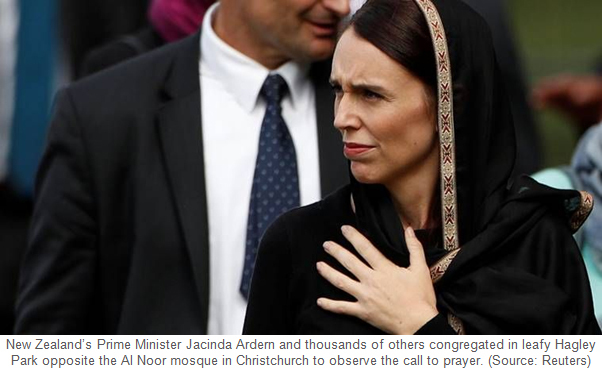 A few days after the massacre, while addressing parliament, Ms Ardern began her speech with the Islamic greeting “As-salam alaykum.” She said racism is something New Zealand needs to confront as a nation and called for a global fight against extremism. 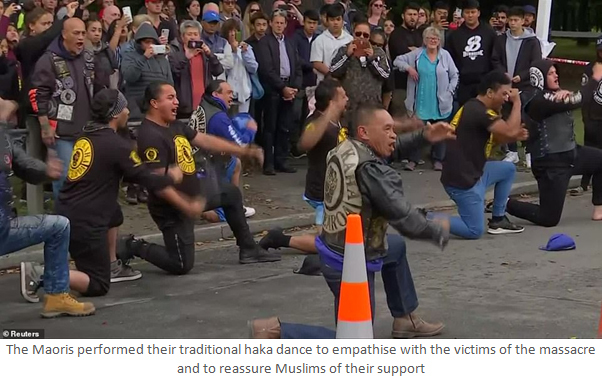 On March 23, more than a thousand people, mostly white New Zealanders and Maoris, marched in a rally against racism in Auckland, New Zealand’s biggest city. They carried placards that read, “Migrant Lives Matter” and “Refugees Welcome Here”. Tarrant may have been a lone shooter, but he represents a widespread and growing campaign of hate, racism and Islamophobia, which transcends national and geographical boundaries and which is supported, rationalised and aided and abetted by politicians, journalists, writers and commentators. 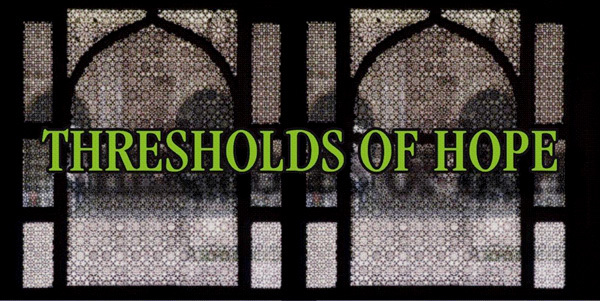 In many parts of the world – from Switzerland to Poland to the US and Australia – there is an unmistakable resurgence of anti-immigrant and anti-Muslim sentiments. Hate crimes against migrants and Muslim minorities in many parts of the world are growing in frequency and intensity. US President Donald Trump calls the flow of immigrants an “invasion.” Hungary’s prime minister Viktor Orban claims that a Jewish billionaire is plotting to flood Europe with Muslim migrants in order to swamp its Christian population and culture. This growing subculture of hate, racism, manufactured paranoia and self-righteousness is being increasingly disseminated on the Internet and social media.